Following the release of the all-new GW-B5600 Series in Japan and Asia, Casio America announced the G-Shock GWB5600BC-1B for a November 2018 release with a list price of $200 USD. 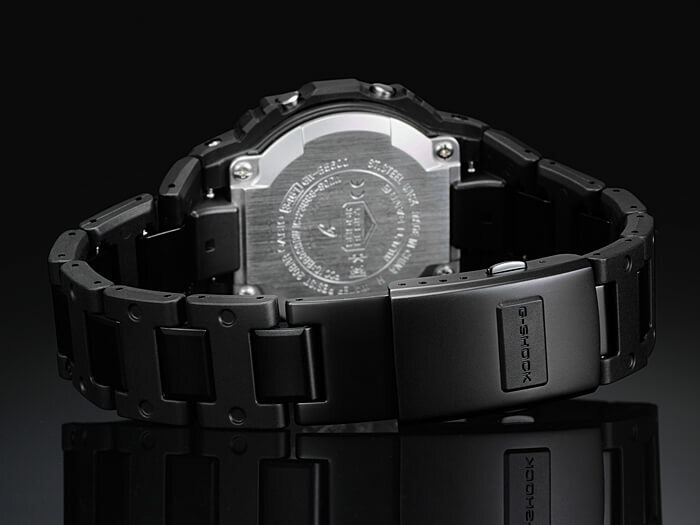 The GWB5600BC-1B is a basic black origin-inspired model with stealth bezel lettering, a clean symmetrical face design, a reverse LCD display, and a resin-link composite band with a 3-fold clasp. The GWB5600BC-1B has the same internal features as the popular full-metal GMW-B5000 series including Tough Solar power, Multi-Band 6 radio wave timekeeping, and Bluetooth mobile link. 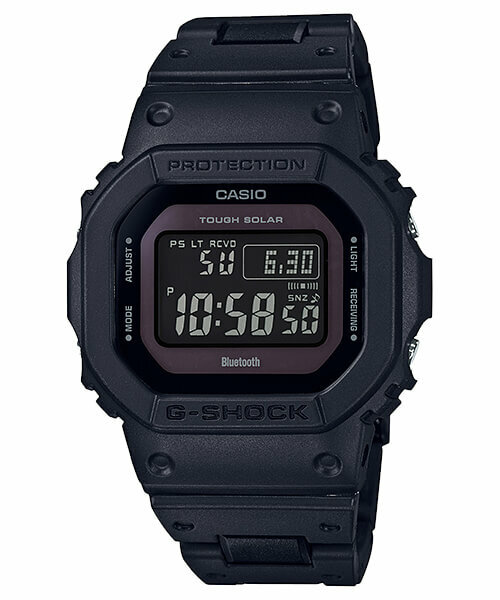 Externally, this model has a resin exterior and does not have the upgraded STN LCD display of the GMW-B5000 series. An advantage of the GWB5600BC-1B is its lighter weight at 85 grams versus 167 grams for the full-metal GMW-B5000. By linking to the G-Shock Connected app on a smartphone, the Bluetooth link offers automatic time adjustment, 300-city world time with 5 settable world time cities, reminder alerts with text description (for certain dates, a range of days, or days of the week), a time & place mapping log, and a phone finder function. Other unique features over other square 5600 models include the ability to change the month/date order (such as to DD/MM) and the day of the week abbreviation is available in six languages. The watch can be operated with or without using Bluetooth at all. We recently covered the Bluetooth features of the GMW-B5000 and GW-B5600 and highly recommend using Bluetooth, as using the G-Shock Connected app makes adjusting the settings a lot simpler and offers additional features. If battery usage is a concern, automatic time adjustment can be disabled so that any feature requiring Bluetooth must be initiated by the user. Other features include shock resistance, 200-meter water resistance, 5 daily alarms with 1 snooze alarm, 1/100 second stopwatch, countdown timer, power saving mode, low battery alert, and full auto Super Illuminator LED light with adjustable afterglow. I’d like one that looks like this with a positive display and a resin strap. I prefer bracelets that have a tool-free micro adjust, something this one does not have. It is composite with resin links and metal inner parts. I believe the information there could be wrong as there is no mention of an STN display on the Japan or Asia sites and the description here also mislabels the watch as the “GMWB5000BC-1B.” Also I remember people who own it talking about it not being STN on the forums and in photos posted by owners it doesn’t appear to be STN. I just addressed this. If the first part of the sentence is wrong, don’t you think the last part of it could be wrong too? This model is not the GMWB5000BC-1B as it says. The GMWB5000BC-1B or GMW-B5000BC-1B does not exist. If it did I’m sure it would have an STN display like other GMW-B5000 models. This is the GWB5600BC-1B which is part of the GW-B5600 series. I have seen mistakes on official sites before and in cases like this I follow the Japan site. I consider this to be one of the most important releases of the year and have been following it well before it was added to the US sites. Whether or not it has an STN LCD was one of the most pressing questions that I was researching on official and unofficial sites and forums. I wish this model did have an STN LCD, but based on ALL the evidence I believe that it doesn’t and I think the US sites are wrong. I just bought this watch, or rather my wife realized how much I liked it and got it for my birthday in 3 weeks. IO absolutely love it and think it might be the nicest watch I have ever owned. I say that having owned 2 Seiko titanium dive chronos and a citizen eccodrive. I have also owned a few of the round G shocks since the 90’s including one I bought in Japan with the beefy nylon band. I feel it may be the nicest ever because it’s a total package for me. I am hard on watches. All my nice watches have been destroyed. Even my first G shock in 96 lasted 5 hours before getting ripped off my wrist. Fortunately it only needed a new pin but you get my point. Only G shocks can last for me and they all still function even the one form the 90’s. But I have never liked wearing them. I get used to the bulk but am never happy with it. 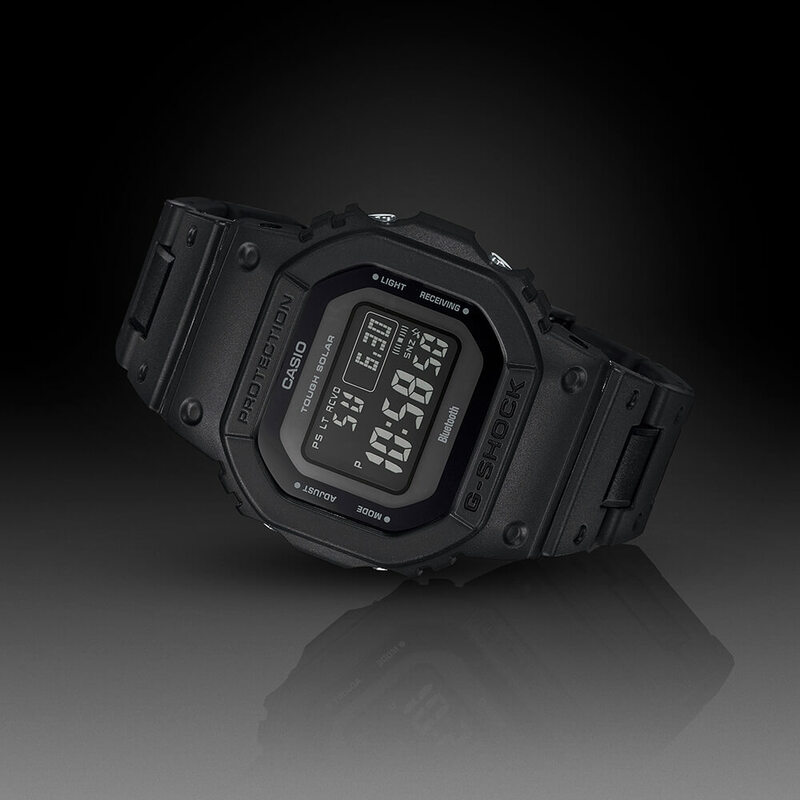 I never new about the early square G Shocks until I just happened upon this on everydaycarry.com. I read the article and then checked it out on Amazon. The bracelet and solar charging on a less bulky G Shock caught my interest. So when I found out Macy’s had them in stock with a 20% discount this weekend I had to go try it out. 7 hours later and I am loving it. The bracelet is very comfortable and the overall weight and bulk is so much nicer than any grown up watch I have ever worn. The rugged durability of a real G Shock without all the obnoxious bulk and busy complications is heaven. The icing on the cake is the solar charging, Bluetooth and the outstanding bracelet. But I have not been able to connect to my phone. Has anyone else had problems. I cannot initiate a cache clear on the watch either. I follow the prompts and the sink starts. My phone even starts the countdown a couple of times before throwing an error and restarting. When I try to activate the clear sequence on the watch I get an error after clicking mode 5 times and then holding down adjust for 2 seconds. I’m hoping to resolve this soon before exchanging for another.